Your webpages title tags are very important to high search engine rankings, title tags are so important there’s multiple articles about title tags SEO on this site. Google Webmaster Tools under “Search Appearance” >> “HTML Improvements” >> “Duplicate title tags” shows webpages with duplicate title tags. In a perfect SEO world you wouldn’t have any duplicate title tags, but the larger a website gets, more likely you’ll have duplicates. This website has 200 odd WordPress posts, but because of the Stallion SEO Super Comments feature which is part of the WordPress SEO Package I develop, Google has indexed thousands of webpages you wouldn’t see indexed on your average WordPress blog (this is a good thing, they generate free traffic). WordPress blogs generally lack any SEO features related to comments. Reports recently hovering between 4,700 and 4,800 pages indexed, which considering there’s around 3,800 comments Google can index here is close to 100% indexed. Without the Stallion SEO Super Comments feature and thousands of comments I’d probably have 400 pages indexed in Google. I see 76 duplicate title tags. Considering I have 4,700+ pages indexed in Google and most are SEO Super Comments and their Comment Titles are used as the title tags, that’s pretty good. Comment titles are another Stallion Responsive WordPress SEO Package feature. If you’ve had to keep an eye on over 3,000 comment titles spread over 200+ posts a few duplicates are expected. Looking through the duplicates, although there are 76 duplicate title tags (potentially 76 indexed pages) it affects 35 unique phrases (used as title tags). 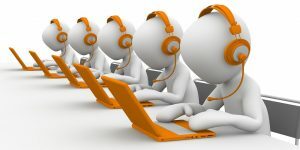 Most are the same phrase that has been used on two webpages, there are 6 phrases used on 3 webpages, the rest are used twice. Most of these are a result of duplicate comment titles, any URL ending in ?cid=17785 is a Stallion SEO Super Comment page and the title tag is that comments title and some are duplicate. The red dots on the screenshot below shows some of the duplicates. This is easy to fix if you think it needs fixing. Edit the comments so their comment titles are all unique. To fix all my comment title related duplicates I’d need to edit 19 comment titles. This would remove over half the duplicates. Since I was looking at the comments in question I’ve already modified some of them, when Google reindexes those comments the number of duplicate title tags will reduce. This is an interesting one, the WordPress replytocom canonical URL ‘bug’. It’s not really a bug. 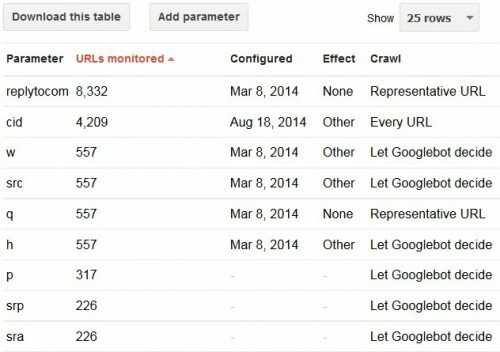 They are the same webpage (completely identical), but with a variable ?replytocom=##, you can find under Google Webmaster Tools “Crawl” >> “URL Parameters” thousands of these URLs. This isn’t a duplicate title tag issue per se, it’s a WordPress core SEO problem which I’m partially responsible for. One of my WordPress development tickets managed to persuade WordPress core developers to remove the rel=”nofollow” attribute from the “Reply to Comments” links (on comments) because nofollow deletes link benefit. This means Google can now index the ?replytocom=## URLs and though we have a correctly formatted canonical URL on those URLs that include ?replytocom=## Google still manages to index some of them by mistake. On my site I see Google has discovered 8,332 URLs including replytocom. 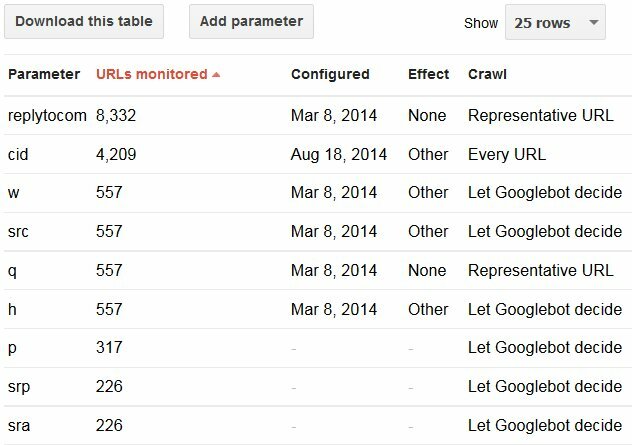 This doesn’t mean Google has indexed over 8,000 URLs with this variable, just means it can find over 8,000 links with the above format. This is not ideal SEO wise, but better to have this minor canonical URL issue which has no major negative effects than have most of your link benefit deleted using nofollow. If WordPress kept the rel=”nofollow” tag that would be 8,000 link benefit deleting internal links!!! Based on the number of duplicate title tags with the replytocom parameter (all these URLs will have a duplicate title tag, everything is duplicate) it means for my site Google has indexed one by mistake: the above one is the only one listed under “Search Appearance” >> “HTML Improvements” >> “Duplicate title tags”. I used to see more, in Stallion Responsive 8.1 I’ve added an SEO fix for this (changed the “Reply to Comment” links to forms) which for me is reducing the number of URLs indexed with the ?replytocom=## variable, will take a LONG time for Google to remove them all: difficult to say if the Stallion Responsive 8.1 fix will remove them all, it should given time, on a new WordPress install it should stop it completely since the links no longer exist (a form isn’t a link). Anyway, so the above duplicate title tag isn’t really a duplicate title and Google can manage these with no input from us (ignore them). There are still duplicate title tags left, these are a combination of giving webpages the same title. For example I have a category with the title tag “WordPress SEO Plugins” and a WordPress post with title tag “WordPress SEO Plugins”. Easy to fix, change the title of one of them. Your posts comments will be paginated (spread over multiple pages). 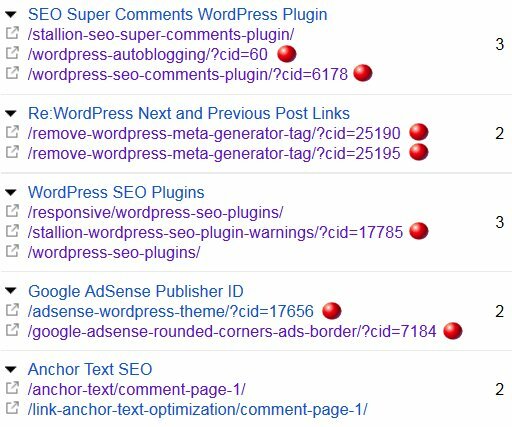 The Yoast WordPress SEO Plugin recommends NOT paginating comments, has a big RED warning when you set this option AND the Yoast plugin sets a noindex on the paginated comment pages wasting SEO link benefit!!! 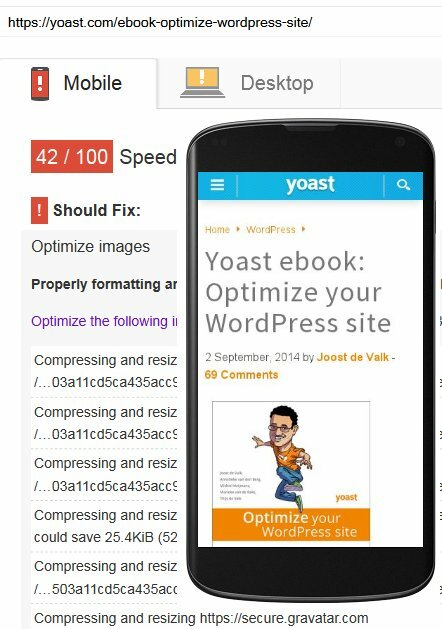 For performance and basic SEO reasons it’s a good idea to use this paginate comments setting (ignore the Yoast red warning), some of my posts have over 100 comments, imagine the performance hit having to load a post and 100+ comments on one webpage (that could be 100 Gravatar images for example!) and how much it might dilute your SEO when there’s more comment text than content!!! 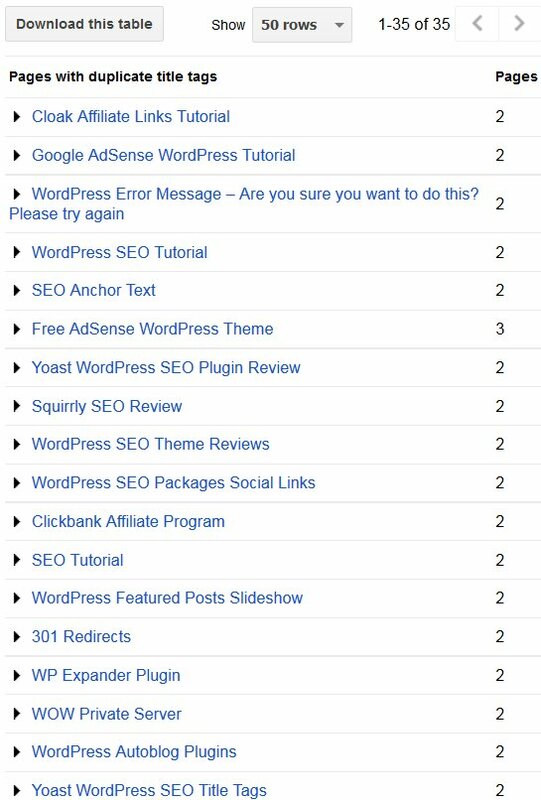 Look at how much Google PageSpeed Insights damage following Yoast advice on Yoasts own website. Yoasts mobile speed is 42/100 and has the “Reduce server response time” warning because it took 1.3 seconds to connect, that’s not good!!! As you can see above, even on a website that makes a living selling an SEO service purported to speed a site up they have awful speed results! With your average WordPress theme all the paginated comment pages use the same title tags, so they don’t add a great deal SEO wise. 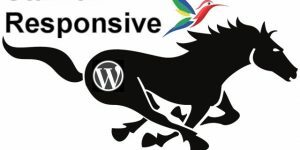 As a Stallion Responsive user it’s an opportunity to benefit SEO wise from these additional paginated comment pages because they use the Stallion Keyphrases (set on your posts edit page). Stallion has 6 different keyphrases it can choose to use as a title tag, this means the main article and /comment-page-1/, /comment-page-2/, /comment-page-3/, /comment-page-4/ and /comment-page-5/ have different title tags. The How to Make Money Online post currently has 78 comments spread of 8 paginated comment pages. As you can see the main article and paginated comments up to page 5 have unique title tags, paginated page 6 repeats the pattern, so page 9 would have the same title tag as page 3. This pattern repeats up to page 30 at this point they use the same title tag. With using Stallion Responsive and setting the Stallion keyphrases (on each Edit post screen) you can significantly reduce the number of dupliate title tags and more importantly benefit from additional SERPs. Number 1 in Google for “Make Money with Free Google Traffic” for example, wouldn’t have the SERP without Stallion Responsive. 77/100 mobile speed and no “Reduce server response time” warning which means it’s loading in under 0.25 seconds. Yoast with 69 comments not paginated takes 1.3 seconds for the server to respond. Stallion Responsive with 78 comments and paginated comments loads in under 0.25 seconds. This site is on an inexpensive Godaddy VPS server, Yoast pays significantly more for hosting** AND pays for a MAXCDN CDN (Content Delivery Network) which speeds the loading of a site up. ** From Yoasts site: I trust the hosting of Yoast.com to Synthesis, the managed WordPress hosting platform operated by Copyblogger Media. Synthesis hosting plans start at $47 a month for standard hosting and up to $300 a month for other options, I guess Yoast doesn’t use standard. That will be for one domain. I run about 50 domains on my VPS for $71.99 a month including tax (hosting this domain for under $2 a month) and I don’t pay for a CDN (MAXCDN costs from $9 to $300 a month), have setup a local CDN (just a sub-domain) for free.